Powered by: The Avery Point Group, Inc.
"As an executive recruiting and search firm, we have a unique vantage point from which to track the latest trends taking place in industry. Trends in industry are often telegraphed into candidate requirements in job postings and they can serve as a window into the latest corporate initiatives." Second annual study by Lean & Six Sigma executive recruiting and search firm The Avery Point Group finds that companies increasingly want talent that has both Lean and Six Sigma as part of their continuous improvement DNA. As courtships go, none has been more contested and anticipated than the evolving relationship between Six Sigma and Lean. According to a recent study by The Avery Point Group, a leading national executive search firm specializing in Lean and Six Sigma, there are increasing signs that these two corporate initiatives are headed down the aisle of eternal matrimony. "As an executive search firm, we have a unique vantage point from which to track the latest trends taking place in industry," says Tim Noble, managing principal of The Avery Point Group. "Trends in industry are often telegraphed into candidate requirements in job postings and they can serve as a window into the latest corporate initiatives." Based on a recent sampling of internet job board postings, The Avery Point Group study found that Six Sigma still outpaces Lean by a wide margin when it comes to desired skill sets. However, for those companies seeking Six Sigma talent, fully one-third are looking for practitioners to also have Lean expertise as part of their tool set. For companies seeking Lean talent the desire is even greater for candidates to also possess Six Sigma knowledge, with almost half of all Lean jobs posted requiring Six Sigma exposure. The merger between Six Sigma and Lean is also clearly evident for jobs posted at the very heart of Six Sigma’s key leadership roles. Almost half of all companies seeking to specifically hire Master Black Belt and Black Belt talent required candidates to also possess Lean as a core part of their tool set. "When it comes to desired skill sets companies want to have their cake and eat it too," says Noble. "Even though companies may not have a full-blown Six Sigma or Lean deployment underway, they highly desire talent that possesses both Six Sigma and Lean skill sets as part of a candidate’s DNA. Continuous improvement practitioners on either side of the aisle might want to sit up and take notice that this wedding is clearly underway." For further evidence of this tryst, one only need look to published books. 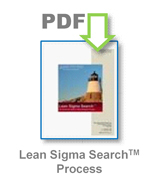 Six years ago books published on the combined topic of Lean and Six Sigma were virtually nonexistent. Today, however, they dominate the continuous improvement publishing landscape. Over the past two years alone, books published on the combined topic of Lean and Six Sigma represented almost half of the Lean books published and a quarter of the Six Sigma books published. For some purists, this mixed marriage is viewed only with contempt; for others it is seen as a natural progression - the result of companies seeking to blend the best of both methodologies in order to remain competitive in today’s global economy. "Those that perpetuate the divide between Six Sigma and Lean are clearly missing the point," says Noble. "Core to both methodologies is the idea that challenges need to be approached with an open mind, because solutions can sometimes come from the most unlikely of sources. True Six Sigma and Lean practitioners will view this marriage with an open mind and realize that these are truly complementary tool sets, not competing philosophies." The Avery Point Group is a global executive recruiting and search firm that assists companies in identifying, assessing and recruiting mid-level management to senior executive Lean & Six Sigma talent. Our firm leverages its principals’ decades of executive Lean & Six Sigma operations and staffing experience to provide the highest quality executive search services. 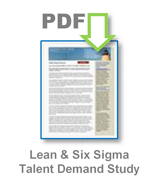 How is Our Lean & Six Sigma Executive Search and Recruiting Firm Different? With our team’s significant Six Sigma and Lean executive experience, we are uniquely qualified to help our clients find, assess and recruit the right continuous improvement and operational excellence talent. Our key principals are Six Sigma Master Black Belt and Lean trained by globally recognized industry leading Fortune 500 companies and have real-world executive experience leading their application in manufacturing, distribution and service-based industries. Our key principals have managed global operations and led key Lean & Six Sigma initiatives in Eastern Europe, Western Europe, Latin America and throughout Asia. Our principals, with their global perspective, understand what it takes to find, assess and recruit talent for companies to succeed in today’s global economy. Unlike other Lean & Six Sigma executive recruiters and search firms, we truly speak the language of our clients and candidates. How Critical is the Right Continuous Improvement Talent? According to a leading business magazine study, only 2% of plants have reached world-class manufacturing performance, with an additional 23% making significant progress toward this enviable status. The common theme found among these superior operations was a fully implemented and effective continuous improvement methodology. Of the plants that have made little or no progress toward world-class performance, 53% reported having some level of continuous improvement effort already in place. The study very pointedly suggests that these improvement efforts might be suffering from half-hearted and unfocused efforts or worse yet, disinterested or incompetent leadership. The overall findings of this study point to the fact that most operations could dramatically improve their performance by having the right leadership talent in place. Our focus is to help our clients find the right talent to maximize their continuous improvement / operational excellence efforts and help them achieve world-class performance. 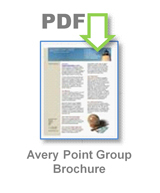 The Avery Point Group, Inc.